Yes! IT's TRUE!!! I buy all of my fonts, clip art, and other teacher resources on TpT every day of the year and then provide those sellers with a fair rating and comment. I love this feature about TpT and that's why I'm telling you about it, so that you can receive discounts on items for your classroom OR maybe even FREE resources that you have EARNED! 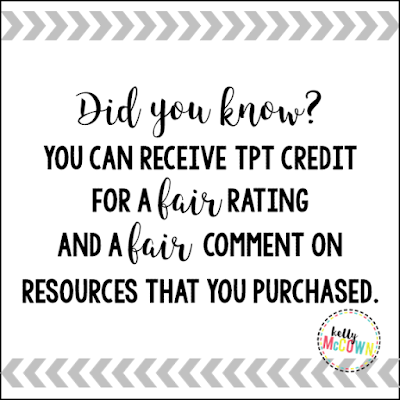 1) You receive one TpT Credit for every $ you spend on TpT when you Provide Feedback — both a fair rating and a fair comment — on the items that you purchase. 2) Every 100 Credits is worth $5 that you can apply towards future TpT purchases, but there’s no need to wait until you have 100 to redeem them. 20 credits are worth $1.00, for example! To date I have only received about 20% feedback from other teachers. That means that 80% of teachers are MISSING OUT on FREE $$ to gain more resources for their classroom. This is another great feature about TpT and I hope you take advantage of it too!